A portion of the GMRT 325 MHz image of the DEEP2 field. The field is 1.0 x 0.5 deg2 and rms noise is 100 µJy (credits: C.H. Ishwara-Chandra). 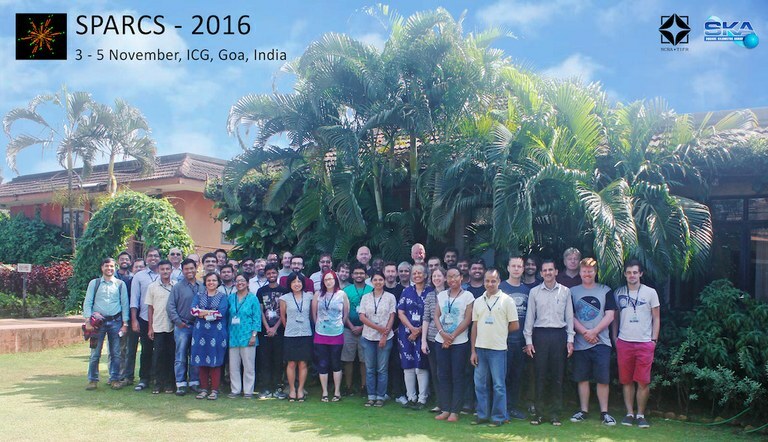 The 2016 meeting of the SKA Pathfinders Radio Continuum Surveys (SPARCS) will be hosted by National Centre for Radio Astrophysics (Tata Institute of Fundamental Research), in Goa, India from 3 to 5 November 2016, just before the SKA conference "SKA 2016: Science for the SKA generation". 2016 will see important milestones on the pathway to SKA continuum survey science. The ongoing GMRT upgrade is nearing completion and the second phase of upgraded system has already been released to astronomical community. Early science with MeerKAT and ASKAP will begin, with full operations to follow on the time scale of a year. 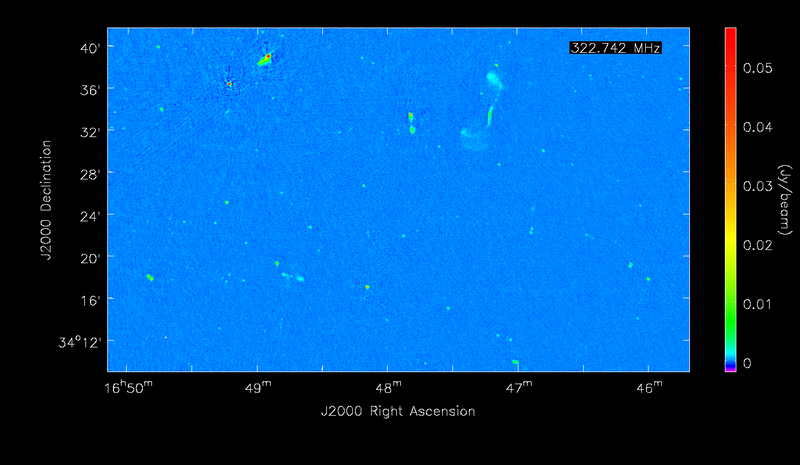 These pathfinder instruments have opened up opportunities for high impact SKA pathfinder programs. Developments at the MWA, JVLA and LOFAR continue to provide important scientific and technical direction for the next generation surveys. This year will see important milestones on the pathway to SKA continuum survey science. The state of Goa, India is considered a major tourist destination, owing to its beautiful beaches, sites of worship and world heritage architecture. The famous Dona Paula Beach https://en.wikipedia.org/wiki/Dona_Paula is located about three kilometre from the ICG. For registration, please send mail to SPARCS-2016 <sparcs2016@ncra.tifr.res.in> giving name, affiliation and status (student/post-doc/faculty). The early registration fee is INR 3500, which covers lunch, tea/coffee with biscuits/cookies during session-breaks, packaged drinking water, Wi-Fi at the meeting hall, etc. The registration fee is to be paid through bank transfer (account details given below) before 16 September 2016. Participants who want to pay after the early registration deadline or at the meeting venue will be charged the registration fee of INR 4000. If you need invoice for paying the registration fee and accommodation charges, please write to us. Young researchers, e.g. students, post-doctorals who need the registration fee waiver should write to us at SPARCS-2016 <sparcs2016@ncra.tifr.res.in> and request their supervisors to support the same. NCRA-TIFR has booked 30 room occupancy from 2 to 5 Nov 2016 (check-in 2nd Nov after 12 noon, check-out 6th Nov 10 am). The tariff is INR 3500 + tax (INR ~4000) for single occupancy, and INR 4500 + tax (INR ~5200) for a double occupancy room. Kindly transfer the amount to account details (given below) for the no. of days for accommodation and write back to the meeting email. Participants opting to book double occupancy room should find their partners themselves. Booked accommodation may be cancelled as per the norms of the ICG. The discounted rates applicable for the SKA Science conference are also valid for the duration of SPARCS-2016 meeting (booking title should be SKA2016 meeting). Note that November is high tourist season, we strongly advise participants to book early. 3) Branch - NCRA Ext.counter, Pashan Road Branch, Pune 411007 Maharashtra, India. Please include word, "Abstract" in the subject line.